Ed Sarin had two goals and an assist as Washington Township defeated Eastern 5-3 at the Skate Zone in Voorhees in Tier 2 action on Monday night. 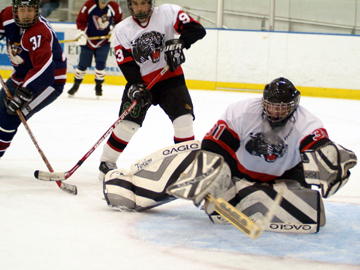 Coming off an 11-2 loss on Friday night Township got strong play in nets from Rich Van Sciver as he stopped 26 shots. Al Orth scored the only goal of the first period on the power play, with Sarin getting the assist. After Torin Lawson tied the game at 1-1 in the opening seconds of the period, Sarin put Township ahead banging home a goal from in tight. Tim Larkin scored three goals and Jason Irlich added two goals and an assist as Williamstown defeated Rancocas Valley 5-3 to win their first game of the season. Sean Fleming led RV with two goals.Larkin scored four minutes into the game, and that turned out to be the only goal of the first period. After Larkin scored on a breakaway in the opening moments of the second period, Irlich followed up with his first of two goals with Jim Watkins assisting and the lead grew to 3-0. Billy Berenato scored three goals as Cherry Hill West defeated Eastern 6-5 in a Tier 2 contest played at the Skate Zone. West had built a three goal lead, only to see Eastern rally late in the third period. Torin Lawson led Eastern with three goals, but the Vikings are still looking for their first win. The first period was evenly played as both teams scored twice, Berenato scored in the games first minute, but Lawson tied the game at 1-1 as he picked the puck up at center ice and flew down the left side and his back-hander found the long side. West retook the lead with just under three minutes remaining as Ryan Monahan created an opportunity down low and after the initial save, Bob Sharpe put home the rebound for a 2-1 lead. With thirty-four seconds left in the period Lawson found the top shelf and his second goal tied the game at 2-2. Moorestown used solid goaltending and good defense as they defeated Washington Township 3-1. Craig Rushmore stopped all but one shot, giving up a goal with three seconds left and Mason Riley, the Township goalie coming off a game where he surrendered 10 goals, played solidly in keeping his team in the game. After a scoreless first period, Moorestown got the only goal of the second period as Shane Brennan scored on the power play with Ben Smith and Jarrod Clark assisting. Shawnee has come flying out of the gates, winning its third straight game and scoring 10 goals again, this time thrashing Washington Township 10-1, at Voorhees on Friday night. Matt McDonald led the scoring barrage with four goals, three coming in the first period. Sophomore goalie Mason Riley was making his first start and will fare better with some defensive help. Shawnee seems to be on a mission having fallen short last year in its quest for a championship, which was won for the second consecutive year by Township. Four different players scored as Lenape defeated Timber Creek 4-1 in Tier 2 action at Hollydell on Friday evening. The only goal of the first period came on the power play with Timber Creek down two men, Mark Lesher was set-up by Sean Driscoll and Lenape led 1-0. That was all the scoring as Max Holz for Lenape and Bill Schindler for Timber Creek played solid in goal. Ryan Phillips put Lenape in front 2-0 as his quick wrist shot from the slot found the top shelf. Moments later Scott Kreifels poked home a loose puck in front and the lead was 3-0. With Timber Creek on the power play late in the period, Mike Schwer put home a rebound of a shot by Tom Szabo to cut the lead to 3-1. Timber creek would get no closer and Tom Burns closed out the scoring for Lenape scoring with four minutes remaining in Lenape's 4-1 victory. Matt McDonald had a hat trick and Connor Dragone and Chris Lowney added two goals each as Shawnee routed Clearview 10-0, marking the second consecutive game that Shawnee scored 10 goals. Shawnee dominated from the opening period as they launched 24 shots while on their way to scoring five goals. Ed Wallace opened the scoring for Shawnee with Dragone and Lowney scoring moments later, thirty-four seconds apart. And less than five minutes into the game it was 3-0. Brian Ruskowski set-up the next two goals, first Lowney scored his second of the game with just under five minutes remaining in the period, then in the last ninety seconds Joe Crespo tallied to make it 5-0 after one period. Sean Fleming had a hat trick as Rancocas Valley held off West Deptford 4-3 in action played at the Skate Zone in Voorhees. RV led 1-0 after the first period on Fleming's first goal assisted by Peter Heinz. The lead grew to 3-0 as Fleming and Ryan Gifford scored six minutes apart in the second period. 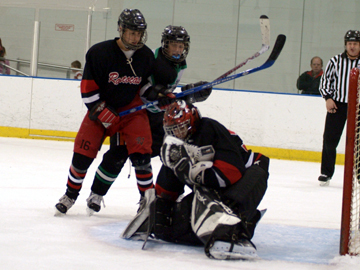 RV goalie Mike Cobb was perfect through two periods having stopped all 21 shots. West Deptford got back in the game early in the third period as Andrew Whalin and Andrew Neary scored goal ninety seconds apart to cut the lead to 3-2. Evan Amato scored twice, including the game winner with less than twenty seconds left in the game snapping a 3-3 tie as Washington Township defeated Eastern 4-3 in Tier 2 action played at the Skate Zone in Voorhees. Despite being out-shot 46-13, Township was able to escape with a win, thanks in large part to the play of Rich Van Sciver who continued his strong play in nets for Township. After each team scored a goal in the opening period, Al Orth for Township and Ryan Berger for Eastern, Township was fortunate to be tied as they were out-shot 13-2. Washington Township had a surplus of new talent entering the season, so much that for the first time in years they can support two Varsity teams. Playing their second game of the season against Cherokee they managed a 3-3 tie at Hollydell on Friday night. Despite being outplayed in the first period, Township led 1-0 on a goal by Brandon Johnson, but thanks in a large part due to the play of Township goalie Rich Van Sciver who stopped all 12 shots he faced. Early in the second period Township led 2-0 as Ryan Carr was sent in by Nicholas String after just fourteen seconds. 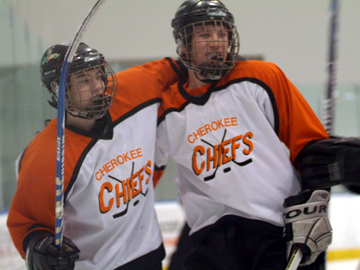 Cherokee got on the board about two minutes later as Mike Ligeikis went top shelf to cut the lead to 2-1. West Deptford defeated Williamstown 4-3 in Tier 1 action played at Hollydell on Friday evening. In the season opener for both teams Williamstown scored the only goal of the first period with Dominic Carusone’s slap shot from the point finding the net with plenty of traffic in front of West Deptford goalie Evan Betz. West Deptford controlled the second period scoring four goals, two on the power play, both times with two-man advantages. Leading 4-1 going into the third period, Williamstown pulled within 4-2 as Mike Lamplugh’s shot from the point beat a screened Betz and the Braves had life. With the goalie pulled and West Deptford down a man, Williamstown cut the lead to 4-3 with less than a minute left in the game, but Betz closed the door to preserve the 4-3 win. 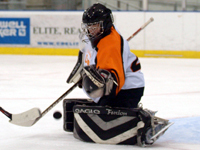 Jack Lyons will hold his 6th College Showcase at the Skate Zone in Pensauken on December 29th, 2007. This showcase is the most successful showcase of its kind, and has seen over 220 players recruited to play college club hockey as a direct result of this showcase. The showcase is for individual players who are looking for an education first and playing competitive hockey second. Only players who will be in 11th or 12th grade or attending a community/junior college during the 2007-2008 school year may participate. Bridgeport native Pete Zingoni was one of three Philadelphia Phantoms to score in a 3-1 win over the Bridgeport Sound Tigers on Saturday night at The Arena at Harbor Yard. Philadelphia scored the first two goals, picking up one halfway through the first period and another early in the second. Kyle Greentree tallied the first goal when, while stationed in the slot, he redirected a Matt Davis drive from the center point past goaltender Michael Mole at 9:44. The lead grew to 2-0 just 78 seconds into the second period. Darren Reid was to the right of the net when he fired a puck from a sharp angle that hit Mole. It rebounded in front to Stefan Ruzicka, who poked it home for the two-goal advantage. Pierre Parenteau scored and posted two assists and Corey Crawford made 37 saves to lead the Norfolk Admirals to a 6-3 win over the Philadelphia Phantoms on Friday night at the Wachovia Spectrum. The loss dampened the first professional goal for Flyers 2006 first-round draft pick Claude Giroux, who scored for the Phantoms along with Mark Cullen and Jared Ross. Norfolk started the scoring at 8:12 of the first period when Parenteau scored off assists from Martin St. Pierre and Cam Barker. But the Phantoms responded just 16 seconds later on Ross's 11th of the year. He knocked a puck away from an Admirals defender in the Norfolk slot and flicked it past Corey Crawford to make it a 1-1 game. Washington Township fell behind 7-3 midway through the third period and rallied for three goals in the final five minutes, but fell short in a 7-6 loss to Haverford High in the AA final in the Flyers Cup Tournament. TJ Haeberle had a hat trick for Haverford, Colin Davis and Christian Biscardi each scored two goals for Township. Thanks to head coach Jim Macchione we had an all access pass and were allowed in the locker room prior to the game, where we found a relaxed and confident team. Coach Macchione felt that if Township could set the tone early that would be one of the keys to the game. Unfortunately Haverford scored three goals in the first four minutes and led 3-0. Biscardi got one back on the power play to cut the deficit to 3-1 heading into the second period. Mark Cullen posted a hat trick and an assist and Boyd Kane farmed four assists to lead the Philadelphia Phantoms past the Springfield Falcons 6-4 on Friday night at the Wachovia Spectrum. Darren Reid, the third member of the line, had a goal and two assists as the Phantoms won their fourth home contest in a row. Kyle Wanvig opened the scoring for Springfield just 58 seconds in. He took a pass from Eric Healey in the slot and fired a puck on net that banged off a couple bodies before it eluded the glove of Martin Houle for the 1-0 lead. Stephen Dixon had a two-goal night to lead the Wilkes-Barre/Scranton Penguins over the Philadelphia Phantoms 4-0 on Wednesday night at the Wachovia Arena at Casey Plaza. Philadelphia remains seven points out of a playoff spot after Albany lost 3-2 to Worcester. Wilkes-Barre/Scranton took a 1-0 lead just 15 seconds into the game. Tim Wallace came down the right side and was able to beat his defender, subsequently walking to the top of the crease before putting a backhander on net. The shot hit the post and came right to Connor James, who put home the rebound. The quarter-minute it took to score tied the Phantoms season mark for fastest goal against. 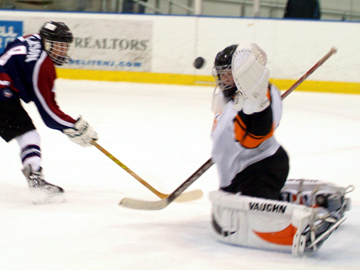 Washington Township trialed 3-1 with under eight minutes remaining in the game, but erupted for five goals over the final seven minutes and defeated William Tennent 6-3 in Flyers Cup action played at the Igloo. After a scoreless first period in which goalie Joe Scafisi played well stopping all 15 shots, Tennent broke through in the second period scoring two power play goals, one by Nick DiChristopher and one by Ed DeWald along with an even strength goal and led 3-0. Cameron Rowand scored a power play goal late in the period to cut the lead to 3-1. Jakub Klepis scored two goals to lead the Hershey Bears to a 5-2 win over the Philadelphia Phantoms at the GIANT Center in Hershey on Saturday night. The Bears took a 1-0 lead with a power play goal 2:02 into the game. A puck came to Matt Hendricks to the right of the net, and he walked in front before beating Martin Houle to the short-side post. Philadelphia evened affairs at 1-1 with 3:51 left in the period when Mark Cullen set up Ryan Potulny for the pair's third goal in two nights. This time Cullen was in the right-side circle when he played a pass into the slot for Potulny, who poked it home while in traffic. But with just 5.6 seconds left, Joey Tenute gave Hershey a 2-1 advantage. He stole a puck in the Phantoms slot and fired it past Houle for the intermission lead. Dave Orlando scored short-handed with four minutes remaining in the game as Garnet Valley defeated Shawnee 3-2 in first round action of the Flyers Cup. After a sluggish first period that ended in a 1-1 tie, Shawnee took its only lead of the game as Joe Pezzato scored on a great pass from Matt McDonald for a 2-1 lead at the seven minute mark. That lead lasted less than ninety seconds as Jake Pilarski scored for Garnet Valley to tie the game at 2-2 heading into the final period. Moorestown could not overcome a slow start and lost in the first round of the Flyers cup 6-3 against Plymouth Whitemarsh. Playing a competitive game for the first time in three weeks, Moorestown fell behind 3-0 after the first period and never recovered. Goals by Davy Johnson, Justin Morrison and Josh Aiello staked Whitemarsh to the three goal lead and the lead grew to 4-0 as Corey Hockman scored the only goal of the second period. Scott Munroe threw the Philadelphia Phantoms on his back Sunday, making 41 saves in regulation and a perfect four in the shootout to lift his team to a 2-1 shootout win over the Portland Pirates on the road Sunday afternoon. The Pirates took a 1-0 lead just over four minutes into the game. Joe Motzko carried a puck into the Phantoms zone and kept moving to the net before stuffing a puck high to the glove side of Munroe. The unassisted marker came at 4:03. Portland nearly held the advantage for the rest of the game, but the Phantoms finally got on the board with 6:45 remaining in the third period. Denis Tolpeko had the puck on the right side and centered for Boyd Kane, who tipped it past Sebastien Caron to tie affairs at 1-1. Mark Cullen added an assist on the play. Philadelphia defensemen Martin Grenier and David Printz both ended personal 23-game goalless streaks, but the Providence Bruins charged back with three goals in a five-minute span to take a 3-2 win over the Phantoms at Dunkin' Donuts Center on Friday night. All the scoring took place in the third period. Grenier's drought-drencher came first, just 1:50 into the frame. Jared Ross won a faceoff back to Grenier on the right point, and his wrist shot beat goaltender Hannu Toivonen to open the scoring. Just over two minutes later, Printz accomplished a similar task. A puck came to him on the left point, and he fired a shot through traffic and past Toivonen at 3:57 of the period. It gave the Phantoms a 2-0 cushion. After month's embarrassment at Voorhees between Clearview and Cherokee, I started thinking about what would be the best course of action to penalize a player, especially a senior, who participates/initiates in a fight during any game, not just a playoff game. Now over the years the league has addressed fighting and the penalty has increased to a 5 game suspension and a $250 fine to the team. We spoke to a few coaches and they are thinking of asking for $250 from a senior prior to the playoffs begins and if you don't put it up you don't play. Well while I do agree with the idea, most parents probably will not, mainly for financial reasons as most of the kids play on travel teams, juniors or whatever and the cost is already huge. Rookie Denis Tolpeko scored twice to lead the Philadelphia Phantoms to a 4-2 win over the Binghamton Senators at the Wachovia Spectrum. Matt Ellison and Mark Cullen also scored for the Phantoms, who earned their sixth straight win of the season over Binghamton and pulled within eight points of the final playoff spot in the East Division. It took less than 30 seconds for the Phantoms to get on the board. Ellison carried the puck into the zone from the left wing side and crossed into the slot. He was stickchekced of the puck, but it bounced off a few skates and came back to Ellison in the right-wing circle. He lifted a backhand past goaltender Kelly Guard just 27 seconds into the game to give the Phantoms a 1-0 lead. Parker Brown scored on the power play with less than four minutes remaining as Washington Township defeated Shawnee 7-6 to win their second consecutive SJHSIHL Championship. Christian Biscardi paced the Township attack netting a hat trick; Matt McDonald who also scored three goals paced Shawnee. The game was back and forth throughout, first Township scored early in the game as Biscardi got things going less than two minutes into the game. Shawnee would score the next two, as Brian Ruskowski and McDonald would give them a 2-1 lead with just under three minutes left in the first period. Christian Fleagle tied the score at 2-2 seconds later and that's where we stood after the first period. Bret Cybulski score two third period goals as Cherry Hill West rallied from a 3-0 deficit and defeated Holy Cross 4-3 and force a deciding game in the Tier 2 Championship. Holy Cross jumped out to a 3-0 lead after the first period on goals by Nick, Mullarkey, Matt Tamez and Mike Lukis but was shutout the rest of the way as goalie John Mehler stopped all 14 shots. Down 3-0 heading into the second period, Bill Berenato scored early to cut the lead to 3-1, and after Ryan Pierce cut the lead to 3-2 at the six minute mark, West was back in the game. Holy Cross could only manage three shots in the period and West had the momentum heading into the third period. For the third year in a row the South Jersey Wings of Steel played an exhibition game against a group of Referees from the SJHSIHL and the Wings once again prevailed 4-1. Goals by Ray Beck, Mike Wilson and Athen Blaine surrounded by the first goal scored by the refs in three years had the Wings in control late into the third period. Solid goaltending by Danny Wheeler and good offensive pressure were the keys to the Wings victory with Team Mom Jessica Shaw leading the way. Mike Molino scored the lone goal for the refs, who were led by Bullet Bob Teti along with Troy and Bob Mansilla, Tim Holz, John Karcher, Nick Karker, Chris Ricciardi, Chucky Maadara, Lou Rucci and Steve Magaldi in nets. On ice officials were Pat Durkin and Wayne Gibb. Holy Cross and Cinnaminson combined for seven goals in the second period, Cinnaminson scoring the first two and Holy Cross scoring the next five for a 5-2 victory and a spot in the Tier 2 championship game. After a scoreless first period in front of a packed house at the Igloo, Cinnaminson scored twice within thirty seconds to take a 2-0 lead. Both goals were set-up by Dave Verbaro, first Dan DiBartolo and then Ryan Quigley. Holy Cross roared back scoring five goals in four minutes to take control of the game. Maxime Daigneault recorded a 31-save shutout to lead the Hershey Bears to a 3-0 win over the Philadelphia Phantoms on Friday night before 10,171 at the Wachovia Spectrum. Hershey opened the scoring at 12:08 of the first period. Dean Arsene ended up being the one cleaning up the garbage on a Hershey scoring opportunity that generated several shots. The puck slid out of a pack to Arsene in the left circle, and he lifted it past Scott Munroe for the 1-0 lead. The Bears added a pair of insurance goals in the third period - a power play marker from Timo Helbling at 16:24 and an empty-netter from Alexandre Giroux with 26 seconds remaining. This Saturday at Hollydell the Wings of Steel will play the South Jersey High School Ice Hockey Referee's in a benefit game to raise money for the team. Gary Scott, of Timber Creek Ice Hockey fame, is running the event which will start at 4:30 PM. Raffle tickets and 50/50 chances will be sold along with some Jerseys. Those wishing to donate used hockey equipment or just to donate a few dollars, are encouraged to stop by and support a good cause. We at SJSports are asking our loyal readers to make an effort to attend. Ordinarily we don't push an event or an outing unless we have strong feelings for it, and this one is very important to us and we ask that you show your support by making an effort to attend. A career night for Matt Davis helped the Philadelphia Phantoms take a 4-1 win over the Bridgeport Sound Tigers on Wednesday night, snapping the home team's nine-game winning streak at The Arena at Harbor Yard. Davis scored twice and had an assist for a three-point night as the Phantoms won for the third time in their last four games. Philadelphia opened the scoring late in the first period with its second shorthanded goal in as many games. Davis was carrying the puck down the right side on a two-on-one and entered the right circle just as defensive pressure let up. He took the opportunity to snap a shot high to the glove side of goaltender Wade Dubielewicz for the 1-0 lead with 1:44 remaining in the frame. TJ DiSpaldo scored with just over three minutes remaining in the second overtime as Washington Township defeated Shawnee 4-3 and moved to within one victory of repeating as league champions. In a game that had as much drama as you could ask for, as Township score the tying goal with eleven seconds left in regulation to force overtime and then controlled both overtime periods after snatching victory from the jaws of defeat. Both teams started out tentative as no one wanted to make the first mistake, Shawnee had the most opportunities as Township was called for the first four penalties of the game. Ryan Wesley scored the only goal for Shawnee as they led 1-0 after one period. Martin Houle turned away 35 of 36 Wilkes-Barre/Scranton shots as the Philadelphia Phantoms took a 3-1 win over the Penguins on Saturday night. Niko Dimitrakos, Stefan Ruzicka and Darren Reid all scored for the Phantoms, who extended their power play streak to 10 consecutive games with at least one man-advantage goal. Dimitrakos started the scoring early in the game, firing home a shot from the slot during a delayed penalty call against the Penguins. The 1-0 lead stood from the 6:15 mark of the first period all the way through the second intermission. Ryan Potulny scored in the first round and the sixth round of a shootout to lift the Philadelphia Phantoms to a 2-1 shootout win over the Portland Pirates in front of 7,041 on Friday night at the Wachovia Spectrum. Niko Dimitrakos scored in regulation for the Phantoms and Scott Munroe returned from injury to make 29 of 30 saves in regulation and four of six in the shootout. After nearly 28 minutes of scoreless hockey, Dimitrakos finally broke the deadlock when he took a pass from a falling Matt Ellison in the left circle and snapped a wrist shot past Sebastien Caron at 7:28 of the second period. The power play tally gave the Phantoms a 1-0 lead. It also extended their power play goal scoring streak to nine games, while Ellison's personal point streak clicked to six games with the helper. It's been almost two weeks since Shawnee played and Williamstown took early advantage jumping out to a 2-0 lead, but Shawnee roared back for a 6-3 win. Brian Ruskowski led Shawnee with a goal and three assists and Ryan Welsey added two goals and an assist. With the win Shawnee will play Township on Monday night February 26th, with the winner having a huge advantage in the double elimination tournament. Williamstown wasted little time as they scored two goals in the games first two minutes as Dennis Cunard and Tim Larkin got things rolling for the Braves. The Philadelphia Phantoms power play had a two-for-three night, but two quick third-period goals were the difference for the Hamilton Bulldogs in a 4-2 win at Copps Coliseum on Saturday night. Stefan Ruzicka and Matt Ellison tallied for the Phantoms. Hamilton took a 1-0 lead 11:14 into the opening period on a goal from Andrei Kostitsyn. But the Phantoms drew even less than five minutes later when Ruzicka notched his power play goal off assists from John Slaney and Ryan Potulny. Philadelphia jumped out to a 2-1 lead 3:54 into the second period on Ellison's goal, set up by Boyd Kane and Nolan Baumgartner. The lead stood through most of the period, but Kyle Chipchura knotted it up again with 3:19 remaining in the second period. Williamstown converted on all three power play opportunities in the first period and Justin Osterdahl scored four goals as Williamstown defeated Moorestown 7-3 in playoff action at Hollydell. Moorestown jumped out to a 1-0 lead four minutes into the game as TJ Cassidy scored, but power play goals by Dennis Cunard, Tim Larkin and Osterdahl gave Williamstown a 3-1 lead after the first period. The second period began with Williamstown having a two-man advantage for a full two minutes; however Moorestown tightened on defense and only allowed one shot on net. Seconds after killing both penalties, Moorestown cut the margin to 3-2 as Greg Hadden on a feed from Colin Corley found the net. The Philadelphia Phantoms scored three straight goals in the second period and held on for a 3-2 win over the Rochester Americans on Friday night at the Blue Cross Arena in Rochester. Eric Meloche earned first-star honors with the game-winning goal. After a scoreless first period, Rochester opened the scoring 5:30 into the middle frame. Anthony Stewart came in on a two-on-one with Clarke MacArthur, and Stewart finished it off with a top-shelf wrister to give the Amerks a 1-0 lead. But the Phantoms responded with two quick goals. First it was Darren Reid taking advantage of an opportune rebound at the 8:21 mark. Reid centered the puck from behind the net and continued around to the left while Denis Tolpeko fired a shot. Goaltender Craig Anderson stopped the offering, but the rebound to the left side intersected Reid's path and he fired it home. Marc-Antoine Pouliot recorded a hat trick to lead the Wilkes-Barre/Scranton Penguins to a 5-2 win over the Philadelphia Phantoms on Wednesday night at the Wachovia Spectrum. 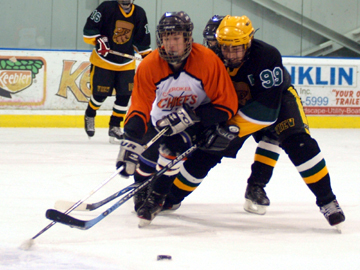 Darren Reid and Denis Tolpeko scored for the Phantoms. Daniel Carcillo started the scoring 4:38 into the game as he swept in a kick save rebound off the pads of Phantoms backstop Martin Houle. Wilkes-Barre/Scranton took a 2-0 lead at 9:25 of the period. A slapshot by Noah Welch from the left side was stopped by Houle, but the rebound came right to Kurtis McLean, who buried it in a vacant net for the two-goal advantage. Justin Osterdahl scored with less than two minutes left in the game as Williamstown rallied from a 2-0 deficit to defeat Eastern 3-2 in playoff action at Hollydell. Eric Miller of Eastern scored the only goal of the first period as the underdog Vikings carried the play for much of the period out-shooting Williamstown 14-5. Torin Lawson scored a power play goal early in the second period and the lead was 2-0, but goals by Bill Fennimore and Tim Larkin tied the game heading into the third period. Both teams managed only six shots each in the final period, but it was Osterdahl who found the net and allowed Williamstown to narrowly escape. For the last few years, Gary Scott one of the founders of the Timber Creek hockey organization has staged a benefit to help raise money for the South Jersey Wings of Steel Sled Hockey team and once again the High School referees have donated their time to be the opponents. This year the game will be played at Hollydell ice rink on Saturday February 24th at 4:30 PM. Managed by Tom Brake and coached by Norman Jones, the Wings of Steel play in the Atlantic Sled Hockey League and consists of players with varying disabilities, but a lot of heart. For those of you unfamiliar with sled hockey, you can check out their web site at www.sjwingsofsteel.com. The American Hockey League announced today that Phantoms captain John Slaney is the recipient of the CCM/AHL Milestone of the Month Award for the month of January. On Jan. 21, Slaney became the first defenseman in the 71-year history of the American Hockey League to reach 500 points in his AHL career when he picked up an assist in a game against the Norfolk Admirals. The historic point came on a power play with 7:47 remaining in the second period when Slaney helped set up a goal by Stefan Ruzicka. Slaney played the puck behind the net for Mark Cullen, who found Ruzicka in the high slot. Ruzicka snapped home his second of the night past goaltender Patrick Lalime to give the Phantoms a 3-2 lead. Matt McDonald had three goals and an assist and fellow sophomores Joe Pezzato and Ryan Welsey also scored as Shawnee flew past Cherry Hill East 8-1 in the regular season finale for both teams. All three have been in the top ten in scoring and with McDonald's four point evening he will just edge out Washington Township's Colin Davis for the overall scoring leader. At the beginning of the season this looked to be a rebuilding year for Shawnee as they skate 17 underclassmen, but the emergence of these sophomores along with the outstanding performance turned in by goalie Paul Gray led them to a 16-1-1 record, and the top seed and favorite in the double elimination tournament. Washington Township scored three goals in the first six minutes of the game as they defeated Eastern 8-4 at the Skate Zone in Voorhees. Needing more players to step up and fill in until the return of seniors Cameron Rowand and David Moore, Township had six different player score goals, led by freshman Jared Emmet with a hat trick. Township converted on the power play as Emmet had an empty net after a perfect cross-ice pass from Colin Davis had drew over the goaltender. Marc Remini and Christian Fleagle added goals forty one seconds apart and suddenly it was 3-0. Eastern got on the board as Jon Hayes banked the puck off the skate of Township goalie Chris Rainey to cut the lead to 3-1, but a late goal by Jonathon Paulo restored the three goal lead at 4-1. Michael Leighton won his second straight start for the Phantoms and earned first star honors with 33 saves as the Philadelphia Phantoms beat the Springfield Falcons 2-1, giving them a two-game winning streak heading into the AHL all-star break. The Phantoms scored first, picking up a power play goal 4:02 into the game. Pete Zingoni filed an alternate flight plan for a John Slaney slapshot from the point, getting his stick on the puck and sending it past Falcons goaltender Jonathan Boutlin for the 1-0 advantage. With just over four minutes remaining in the second period, Matt Ellison registered the eventual game-winner. He was about a foot below the goal line to the right of Boutlin when he fired a puck off the netminder's back and in, giving the Phantoms a 2-0 lead. In a game that played like a playoff game, Washington Township came back from a 2-0 deficit to defeat Williamstown 4-3. With the regular season winding down and Shawnee with a three point lead, Township must win their last two games and hope for some help. Williamstown scored the only two goals of the first period as Tim Larkin scored on a break and Doug Akin deflected a point shot by Mike Lamplugh. Township got on the board early in the second period as Christian Fleagle was set-up by Colin Davis in the slot and suddenly it was 2-1. Williamstown had an opportunity to increase the lead on the power play, but Davis stole the puck and after beating the defenseman, dragged the puck and lifted it top shelf to tie the game at 2-2. Nolan Baumgartner tied a team record with four assists and Pete Zingoni earned first star honors with two gritty goals as the Philadelphia Phantoms topped the Wilkes-Barre/Scranton Penguins 7-2 in front of 7,274 on Friday night at the Wachovia Spectrum. Goaltender Mike Leighton stopped 26 of 28 shots to earn his first win with the Phantoms in his first start for the club. The Phantoms got on the board first with a power play tally from Darren Reid at 12:04 of the first period. David Printz blasted a shot from the right point that hit Mark Cullen and came to Stefan Ruzicka. Ruzicka slid it to Reid, who slammed it past Andrew Penner for the 1-0 lead. Chad Wiseman recorded a natural hat trick to lift the Hershey Bears to a 6-1 win over the Philadelphia Phantoms at the Wachovia Spectrum on Wednesday night. After Wiseman opened the scoring in the first period, the Bears jumped out to a 4-0 second period lead on two more from Wiseman along a Tomas Fleischmann goal before the Phantoms got on the board at 13:26. Riley Cote brought a puck in over the line on the left wing side and dropped a pass off to Frederik Cabana, who fired a long slapshot from the top of the circle that beat goaltender Davis Parley to make it a 4-1 game. Matt Hendricks and Dave Steckel added second period goals in a 19 second stretch to close out the scoring. Colin Davis scored six goals and TJ DiSpaldo added three goals and four assists as Washington Township pulled away from Rancocas 12-3. With the game just 2-1 after the first period, Township took control in the second period scoring four times as DiSpaldo, Davis with two and David Moore all found the net. The third period was all Townships as Davis and DiSpaldo continued to create opportunities. 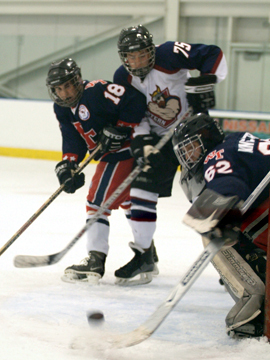 Davis had a hat trick in the period and joining him with goals were Jim Tumolo, Christian Biscardi and DiSpaldo. The Rancocas goals were scored by Mike Walsh, Keven Lion and Shane Veight. Brian Roberts' layup with 27 seconds left was the difference as the Nyack College Warriors pulled out a 60-59 victory over the University of the Sciences in Philadelphia in a Central Atlantic Collegiate Conference men's basketball game at the Bobby Morgan Arena in Philadelphia. The loss drops the Devils record 9-7 overall and 7-4 in league play, moving USP into a tie for third place with Holy Family University with identical 7-4 league records. Nyack improves to 4-13 overall and 3-7 in league play. William Kurtz led all scorers with 23 points, making seven three-point field goals for the second consecutive game and the third time in four games. Kurtz was one of four USP players to reach double figures as Howard Lanier (13 points, 4 assists); Eric Cangelosi (10 points); and Keith Dundas (10 points, 4-4 FG) joined him. Dundas paced the Devils with four rebounds. Torin Lawson scored with two seconds left in the game as Eastern upset Moorestown 5-4 in Tier 1 action played at Hollydell. The win was only the third for the Vikings, who have struggled the last few years after having been one of the top teams since the late 1990's. Tonight was a glimpse of the past as great goaltending and hustle, a trait of Vikings team past, was the key to their upset over Moorestown. Eastern goalie Evan Cohen, despite goals against over six, played outstanding and was the main reason his team was in position to steal the game. After a scoreless first period, Cameron Dougherty put the Vikings up 1-0, Moorestown would score two goals in a span of eight seconds, both in a four-on-four situation, to take a 2-1 lead as Alec Miller and Ben Doganiero got the goals. Jeff Tambellini scored in regulation and then tallied the only goal in the shootout to lift the Bridgeport Sound Tigers to a 3-2 shootout win over the Philadelphia Phantoms on Friday night before 8,556 at the Wachovia Spectrum. For the second consecutive game, Eric Meloche opened the scoring. He carried the puck down the left wing on a three-on-two rush and cut in along the goal line before flicking a wrister that Wade Dubielewicz stopped. Meloche collected the rebound and swept behind the net, then came out on the other side and jammed a backhander through Dubielewicz's pads for the unassisted goal at 15:09. Phantoms goaltender Scott Munroe had a pretty ordinary night going through the first two periods of Wednesday night's game between the Philadelphia Phantoms and Binghamton Senators at the Broome County Veterans Memorial Arena. The third period, however, changed everything. Munroe set a franchise record with 28 saves in the third period and tied an 11-year-old franchise record with 47 saves overall to backstop the Phantoms to a 3-2 win over the Senators. Niko Dimitrakos provided the game-tying and game-winning tallies, while Eric Meloche also scored for the Phantoms, who finished up a four-game road swing with the victory. The Phantoms fought to the final buzzer on Friday night but ended up falling victim to an unlucky bounce in a 5-3 loss to the Lowell Devils at Tsongas Arena. David Clarkson finished the night with four goals for the home team, while three different players provided the scoring for Philadelphia. Lowell jumped out to a 2-0 lead on one goal each in the first and second periods. Clarkson started his night off with a power play tally at 12:20 of the first period when he pushed home a puck that Phantoms netminder Martin Houle had nearly covered up. Then in the second frame, Clarkson scored again at the 12:06 mark. The Bridgeport Sound Tigers outgunned the Philadelphia Phantoms in the shootout to take a 2-1 extra time win at The Arena At Harbor Yard on Wednesday night. Darren Reid scored in regulation for the fourth straight game, grabbing the equalizer in the second period. Bridgeport opened the scoring at 15:50 of the first period. Allan Rourke brought the puck down the right side along the boards before sliding one out to the top of the crease. Petteri Nokelainen redirected the centering bid to make it 1-0. But Reid continued his hot play after the intermission. Reid was trailing as Pete Zingoni brought the puck through the left circle and went deep before dropping it back out in front, where Reid was waiting to knock it home at 8:44 of the frame. Jared Emmet scored two goals and Colin Davis added a goal and two assists as Washington Township defeated Moorestown 4-1. The loss was the fourth in the last five games for Moorestown. Emmet scored both goals in the first period, and they came nineteen seconds apart, both times Davis drew the defense over and that created some space for Emmet, who took advantage of his opportunities. With Township on the power play late in the second period, Davis used his speed to get around the defense and his goal made it 3-0. Three different Grand Rapids players scored in the middle period to lift the Griffins to an eventual 3-2 win over the Phantoms on Monday night at the Wachovia Spectrum. Darren Reid continued his hot play, scoring for the third consecutive game and picking up his fifth goal in that span. The game was nearly at its halfway point before either team netted a goal, and it was Grand Rapids finally striking first at 8:42 of the second period. Danny Syvret fired a shot from the right side point that Scott Munroe stopped, but the rebound went right to the stick of Ryan Keller. Keller fired it into an open net for the 1-0 lead. The night marked Keller's third consecutive game with a goal. The Hershey Bears jumped out to a 3-0 cushion and fought their way to a 4-1 win over the Philadelphia Phantoms on Wednesday night at the GIANT Center. The game marked the 900th professional appearance for Phantoms captain John Slaney. The Bears started the game's scoring at 15:17 of the first period on a solo act by Chad Wiseman. He carried the puck into the Phantoms zone down the right wing side and snapped a wrist shot past the stick side of Martin Houle for the unassisted goal that gave the Bears a 1-0 advantage. Niko Dimitrakos figured in all three Philadelphia Phantoms goals Tuesday night, scoring two himself and assisting on a third to power his club to a 3-1 win over the Wilkes-Barre/Scranton Penguins at Wachovia Arena at Casey Plaza. Phantoms captain John Slaney, a former Penguin, notched three assists in Philadelphia's third victory in its last four games. Thanks in large part to starting goaltenders Scott Munroe and Jeff Deslauriers, the fourth meeting of the season between the intrastate rivals stayed scoreless in the first. The Phantoms had some quality efforts, including a 1-1 with Philadelphia's Triston Grant alone at the top of the crease, only to be denied by the glove hand of Deslauriers. Eric Fehr scored twice to lead the Hershey Bears to a 4-1 win over the Philadelphia Phantoms in AHL action on Saturday night at the GIANT Center. The loss snapped Philadelphia's two-game winning streak. Hershey scored the game's first goal just 56 seconds in. Dave Steckel took an initial shot that was stopped by Scott Munroe, but Steckel cleaned up his own rebound from 10 feet out to give the Bears the early 1-0 advantage. Justin Osterdahl scored four goals and Josh Haines played outstanding in nets as Williamstown defeated Washington Township 6-4 in last game before the holiday break for both teams. Williamstown was in control of the game until midway thru the final period having built a 5-1 lead. Tim Larkin and Osterdahl put Williamstown up 2-0 after the first period and Haines stopped several breakaways. The second period was much like the first, Haines again stoning Township on three breakaways and Osterdahl scoring two goals. Christian Biscardi finally solved Haines and Township trailed 4-1 after two periods despite out-shooting Williamstown 29-12. The Philadelphia Phantoms erased two one-goal deficits in the final period and ended up on the right end of a 4-2 decision over the Binghamton Senators on Friday night at the Wachovia Spectrum. Mark Cullen, Nolan Baumgartner, Pete Zingoni and Boyd Kane scored for the Purple, which earned its second consecutive victory. For the first time this season, the Phantoms played a game through two periods without either side scoring a goal. The scoring drought finally ended 5:33 into the third frame when Binghamton blocked a Phantoms clearing attempt and the puck ended up behind the Philadelphia blueliners on the stick of Ryan Vesce. Vesce bided his time before faking and then beating Scott Munroe to give the Senators a 1-0 lead. Andrew Carsusone scored two goals and Doug Akin added a goal and two assists as Williamstown defeated Eastern 6-3 in Tier 1 action played at the Skate Zone in Voorhees. Dan Drazen scored all three goals for Eastern. The Vikings jumped out early in the game as Drazen scored a power play goal two minutes into the game. But that lead was short-lived as Williamstown responded with goals by Mike Mathews and Justin Osterdahl to take a 2-1 lead after the first period. Carsusone put home a rebound of a shot by Josh Haynes midway through the second period to put Williamstown ahead 3-1 and Akin added a goal just beating the buzzer at the end of the period for a 4-1 margin. Triston Grant and Boyd Kane led the way with two goals apiece as the Philadelphia Phantoms rode a 3-for-4 performance on the power play to a 5-3 win over the Toronto Marlies on Sunday at the Wachovia Spectrum. Petr Nedved contributed three assists for the Phantoms, who snapped a five-game losing skid. Philadelphia struck first while on the power play at 8:26 of the first period. *Petr Nedved* saucered a pass cross-ice to *Denis Tolpeko* in the left circle. Tolpeko, in turn, sent the puck to the top of the crease where *Boyd Kane* redirected it past goaltender Justin Pogge to give the Phantoms a 1-0 lead. High School Ice Hockey, a Sport You are Missing!! Back in the fall of 1998 a few people were starting a web site dedicated to high school and youth athletics, mainly in South Jersey. Initially I gravitated right to football, but after a few games I realized everyone covers high school football. 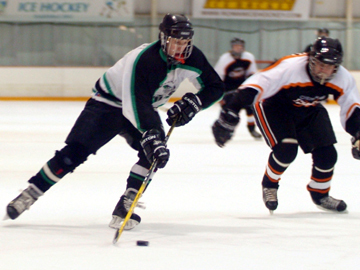 Our editor mentioned that high school ice hockey had little or no coverage, and I immediately said that's for me. Now over the years there has been plenty of excitement and usually a decent amount of fans. Now you always get your big crowds for the neighborhood rivalries, Clearview-Township, Cherry Hill East - Cherry Hill West, etc. But in the last few years attendance has noticeably dropped off, and I really can't figure this out. Is it because of the times? Shawnee goalie Paul Gray used every part of his body, including three great glove saves as Shawnee handed Washington Township their first loss of the season 2-1 in a playoff-like game played at the Skate Zone in Voorhees. Township's lone goal came early in the game on the power play as Christian Fleagle converted a pass from TJ DiSpaldo. Despite scoring just one goal, Township launched 40 shots after the early goal but could not solve Gray. It wasn't for lack of trying. Meantime Shawnee was not generating much offense as the only had 5 shots in the opening period and just four in the second period. Township has five of the top eight scoring leaders in the league and they each had at least two good opportunities each to score but Gray stoned them each time. Dan Folkman scored three goals and assisted on two others to lead Cherry Hill East to a 6-3 win over Eastern. The victory was the first of the season for East after eleven straight losses. With a roster full of underclassmen the team should only get better. Folkman got the offense going as he scored less than a minute into the game. Torin Lawson responded about ninety seconds later scoring on a breakaway. Dan Drazen gave Eastern a 2-1 lead scoring a short-handed goal late in the period, but Folkman responded with a power play goal to tie the score at 2-2 after one period. A bounce off the boards and another off a pair of goalie pads was the difference Friday night at the Wachovia Spectrum as the Chicago Wolves took a 5-3 win over the Philadelphia Phantoms. Matt Ellison celebrated his birthday with a goal and two assists in the setback. Chicago jumped out to a 2-0 lead with a pair of goals 59 seconds apart in the first period. Kevin Doell picked up the first tally 5:33 into the frame, starting the play by pushing the puck ahead out of the Phantoms zone and then taking a give-and-go pass from Colin Stuart before lifting one out of the reach of Scott Munroe's glove. Tim Larkin netted a hat trick and Williamstown survived a slow start and defeated Eastern 4-1 in front of a sparse crowd at Hollydell. Eastern goalie Evan Cohen played a sparkling first period stopping all 16 shots and Eastern took a 1-0 lead in the second period as Derrick Schemmel deflected a shot from the point. Larkin tied the game just over a minute later and Josh Haynes put Williamstown ahead with a top shelf goal later in the period And thirty seconds later Justin Osterdahl sent in Larkin for a 3-1 lead. Larkin completed his hat trick early in the third period, again on a feed from Osterdahl and Williamstown skated away with a 4-1 victory. Ryan Potulny scored two goals, including the game-winner, and Don Morrison had the best night of his young career with three assists to power the Philadelphia Phantoms to a 4-2 win over the Albany River Rats before 5,723 at the Wachovia Spectrum on Friday night. Philadelphia opened the scoring with 9:47 remaining in the first period on a Potulny goal just nine seconds into the club's first power play of the night. The Phantoms won a draw to start the man-advantage and moved the puck to Morrison on the left point. Nolan Baumgartner one-touched a pass from Morrison to the top of the right circle, where Potulny one-timed it past Justin Peters for the 1-0 lead. Connor James scored with just over two minutes remaining in the second period to give the Wilkes-Barre/Scranton Penguins a 3-2 win over the Phantoms on Friday night at the Wachovia Spectrum. The Phantoms opened the scoring with just 1:40 left in the first period. David Printz fired a shot from the point that went wide and hit the back boards, but bounced straight back into the goalmouth. Jussi Timonen was waiting to slide the puck into an open net for the 1-0 lead. Geoff Platt scored two goals and Jarislov Balastik added two assists to boost the Syracuse Crunch over the Philadelphia Phantoms by a 5-2 count on Wednesday afternoon. It was the annual School Day Game at the Wachovia Spectrum, with over 6,000 students among the 7,433 in attendance. Syracuase raced out to a 3-0 lead in the game's first five minutes on goals by Mark Hartigan, Ryan Caldwell and Platt. The onslaught ended Martin Houle's day early and brought Scott Munroe into the game in relief. Colin Davis had two goals and three assists and Jared Emmet notched his first career hat trick at the varsity level as Washington Township flew past Moorestown 8-2 in Tier 1 action played at the Skate Zone in Voorhees. Ben Doganiero and Ben Smith scored the Moorestown goals. After an evenly played first period which ended at 2-2, Township controlled the final two periods, taking advantage of the man advantage, connecting four times on the power play, and getting some key saves by Joe Scafisi when they needed him. On the power play early in the second period, Christian Biscardi broke the 2-2 tie after Parker Brown had came right down the slot and after the initial shot, Biscardi put home the rebound to give Township a 3-2 lead. The Rowan ice hockey team lost to division leading Scranton 5-2 at Hollydell on Saturday night. Mike Pisko led Scranton with two goals, Fred Brewer and Mike Keating scored for Rowan. Playing in the Great Northeast Collegiate Hockey Conference, this young team from Rowan are struggling with a 2-7-2-1 record has a roster of only 7 seniors and should only get better. Under the direction of Coach John Caulfield along with Assistant Coach Mike Husek, solid defense and back-checking are two key areas they seem to stress. 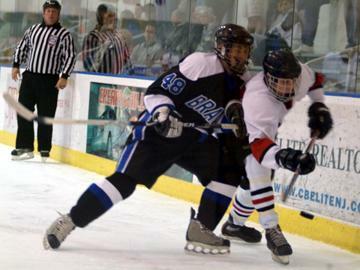 Almost half the roster consists of players from the South Jersey Ice Hockey League that also includes former South Jersey Sports Online Tier 1 player of the year Fred Brewer leading the team in scoring with 10 goals as well as the league. Washington Township scored six goals in the third period to break open a close game and they went on to defeat Eastern 8-0 in front of a sparse crowd at Hollydell. With both teams missing key players, each team called up players from their JV teams to fill out the roster, and Township got an earl contribution from one of the players. After Christian Biscardi scored at the six minute mark to give Township a 1-0 lead, Jared Emmet scored his first goal as a Minuteman on a pass from Christian Fleagle to make it 2-0. Joe Pezzato had a goal and three assists and Paul Gray allowed only one goal as Shawnee defeated Williamstown 4-1 on Monday night at the Skate Zone in Voorhees. Ryan Welsey added two goals for Shawnee while Justin Osterdahl scored the lone Williamstown goal. Pezzato was all over the ice and created numerous scoring opportunities for his team. Welsey put Shawnee up 1-0 as he benefited from a great pass from Pezzato on a 2-on-1 break, as Pezzato drew the defenseman over and slid the puck to Welsey and he banged home the puck midway through the first period. Shawnee had three consecutive power plays and failed to convert, but they did convert when Williamstown had the man advantage. Having come off two straight ties, Williamstown got back on the winning track as they handed Moorestown their first defeat, holding on for a 5-4 win at the Skate Zone in Voorhees on Monday night. Williamstown goaltender Josh Haines stopped 48 shots and Justin Osterdahl netted a hat trick. After the team traded goals in the first period, Ben Smith scoring the first of his two goals for Moorestown and Doug Akin getting the equalizer for Williamstown, Osterdahl gave Williamstown the lead early in the second period on a nice set-up from Vincent Agnesino. Washington Township rolled over Rancocas Valley 13-0 on Monday night in a game where neither coach was aware that the mercy rule was that once a team has a ten goal lead, the game is over. Fortunately a league official came over and halted the game, but its troubling to think that neither bench was aware of the rule. As for the game Christian Biscardi led the offense with five goals and Tom Dispaldo added a goal and five assists. Moorestown scored three goals in the final seven minutes of the game to rally to defeat Eastern 3-1 in action played at the Skate Zone in Voorhees. Eastern goaltender Evan Cohen did everything he could in facing 62 shots and not allowing a goal until the seven minute mark of the final period. Earlier in the game he made several point blank saves to keep the game scoreless. Moorestown goalie Keith Mulligan was doing his part stopping all 28 Eastern shots through two periods. The Vikings broke through early in the third period after some hard work by Jon Hayes and Eric Miller to keep the puck in the zone, with Joel Romberger scored his first goal of the season. Bret Cybulski, Billy Berenato and DJ Nork each scored two goals as Cherry Hill West defeated West Deptford 8-3 in Tier 2 action played on Monday night at the Skate Zone. Luke DeHart scored twice for West Deptford. West got contributions both on the power play, connecting three times and once scoring a shorthanded goal. Nork got things going in the opening two minutes, with West Deptford already down a man, his quick shot caught Evan Betz off guard and West led 1-0. The with West Deptford down 2 men, Monahan converted a pass from Cybulski for a 2-0 lead, then right before the second penalty expired, Cybulski fed Monahan and the lead was 3-0. Dan Drazen took care of the scoring and Mike Dougherty withstood a 21 shot third period as Eastern defeated Clearview 5-3 at Hollydell Arena on Friday night. Drazen scored three goals and assisted on another in scoring his second consecutive hat trick, having tallied three in the win on Monday night. Andrew Michael led the Clearview attack with two goals. Drazen scored the only goal of the first period, on the power play in the opening minute as the Vikings jumped out early. Dougherty made several big saves to keep Clearview scoreless. Drazen again scored an early goal, this time on a steal of a clearing pas and his quick blast, made it 2-0. Paul Gray stopped 32 shots and Shawnee scored three power play goals and one short-handed as they handed Williamstown its first defeat of the year, a 5-2 loss at the Skate Zone in Voorhees. Matt McDonald led the offense with two goals, Doug Akin and Justin Osterdahl scored the goals for Williamstown. Gray kept Williamstown off the board for two periods while his team built a 3-0 lead, two goals coming in the first period on the power play. First McDonald converted a pass from Ryan Wesley from behind the net, then with a 2 man advantage, Paul Kozarsky deflected a shot by Tom Humphreys and Shawnee led 2-0. Early in the second period, Williamstown got caught in a line change and McDonald sent in Brian Ruskowski and his breakaway goal made it 3-0. Meanwhile Gray was pitching a shut out as he stopped all nine shots in the period. Dan Drazen had three goals and two assists to lead the Eastern Vikings over Cherry Hill East 6-4 in Tier 1 action played at the Voorhees Skate Zone. Playing on a line with Torin Lawson and Derrick Schemmel, Drazen crated many scoring opportunities and set-up goals by Lawson and Schemmel. Eastern struck first as Drazen scored an unassisted goal ninety seconds into the game, and the Vikings carried the play for most of the period, out-shooting Cherry Hill 20-9. Jared Annarelli would tie the game midway through the period as he crated an opportunity down low and beat Evan Cohen. Eastern would regain the lead early in the second period as Lawson fed a pass from the slot to Drazen along the left circle and his quick shot found the net and it was 2-1. Moments later Cherry Hill responded on the power play as David Badecki put home the puck after a mad scramble in front of Cohen. Justin Osterdahl had a natural hat trick as Williamstown defeated Cherry Hill East 5-2 at Hollydell on Friday night. Osterdahl scored the only goal of the first period as Eric Finn hit him in stride streaking down the left side and Osterdahl went short-side for his first of three. Williamstown struck, capitalizing on the power play, as Osterdahl skated right up the slot and his blast made it 2-0. Forty seconds later, Osterdahl made it three in a row on a nice give and go play with Andrew Carusone. East showing some speed, but a young team as only twenty percent of the roster are seniors, finally responded as Evan Ascroff’s shot from the point beat Josh Haines, as he never saw the puck. Williamstown responded as defenseman Josh Haynes responded with a shot top shelf and the lead was 4-1.